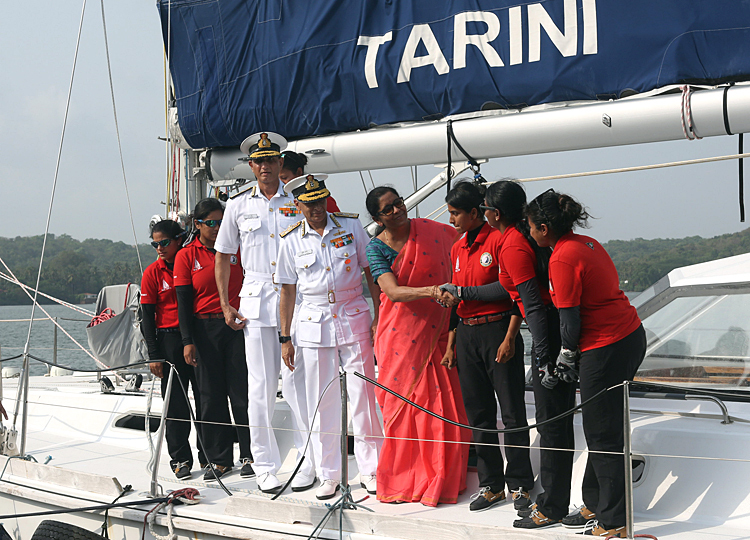 Indian Naval Sailing Vessel Tarini (INSV Tarini) entered Goa harbour and came alongside the INS Mandovi jetty on completion of a historic global circumnavigation voyage on May 21, 2018. 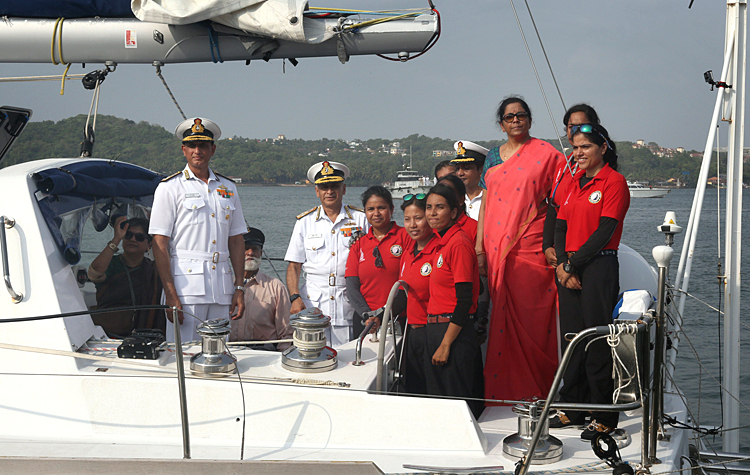 The all-women crew of Tarini was received at the jetty by Smt. Nirmala Sitharaman, the Hon'ble Raksha Mantri who had also flagged them off on 10 Sep last year. 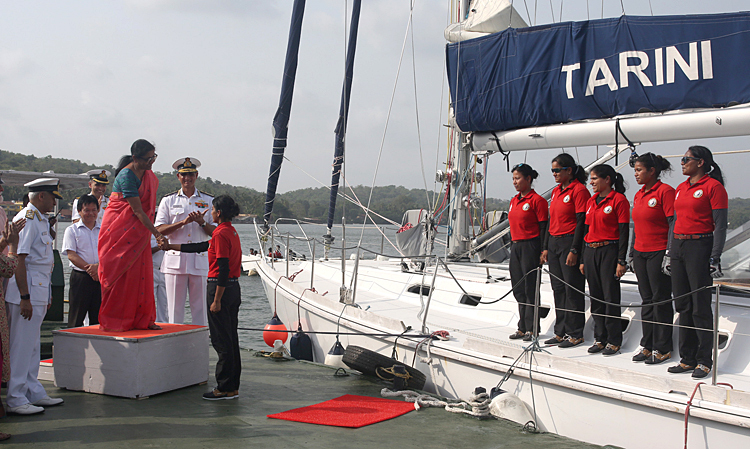 Admiral Sunil Lanba, Chief of the Naval Staff, Vice Admiral AR Karve, Flag Officer Commanding-in-Chief, Southern Naval Command, senior officers and enthusiastic members from the naval community both serving and retired, as well as civilians were present at the Naval Boat Pool to welcome INSV Tarini. 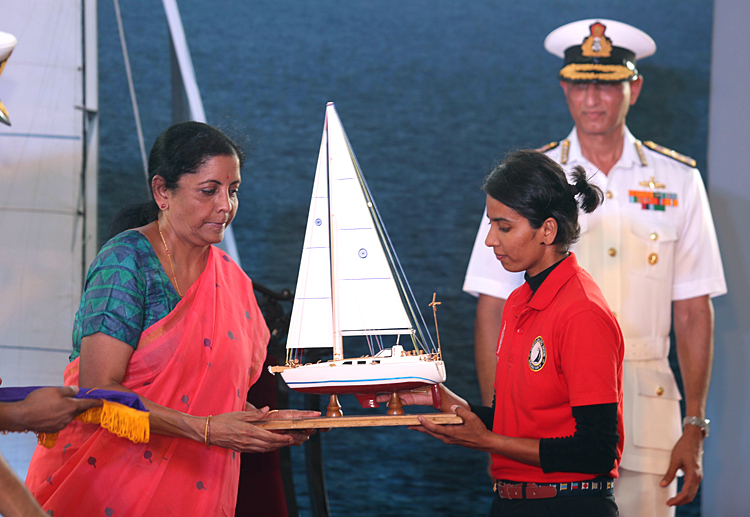 It was a poignant moment for the "Navika Sagar Parikrama" team which included a number of naval personnel who worked behind the scenes from the time of origination of the idea of circumnavigation by an all women crew, right through the planning, implementation and training till the successful execution of the voyage. The women crew themselves were ecstatic on completion of the voyage. 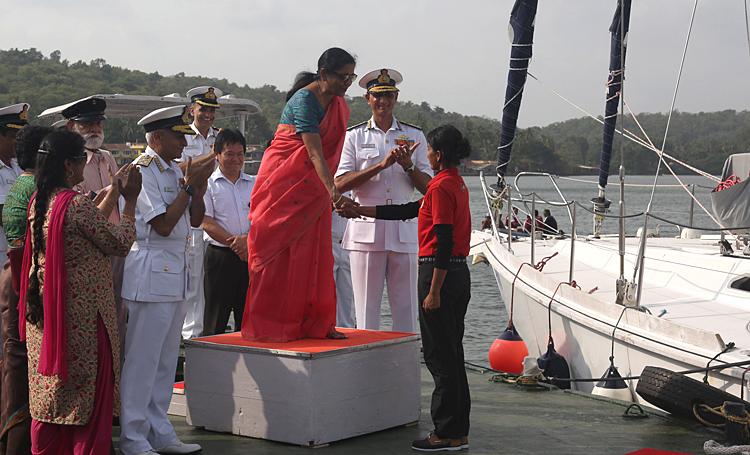 Speaking at the occasion, the Skipper Lt Commander Vartika Joshi said, "We knew at the very start of this voyage that we had a daunting task ahead. However, the many challenges we encountered brought in a new found strength from within, which we ourselves never knew we were capable of. Our close bonding helped us overcome those difficult times." It was also a time for happy reunion of the crew with their families after a period of over eight and half months. 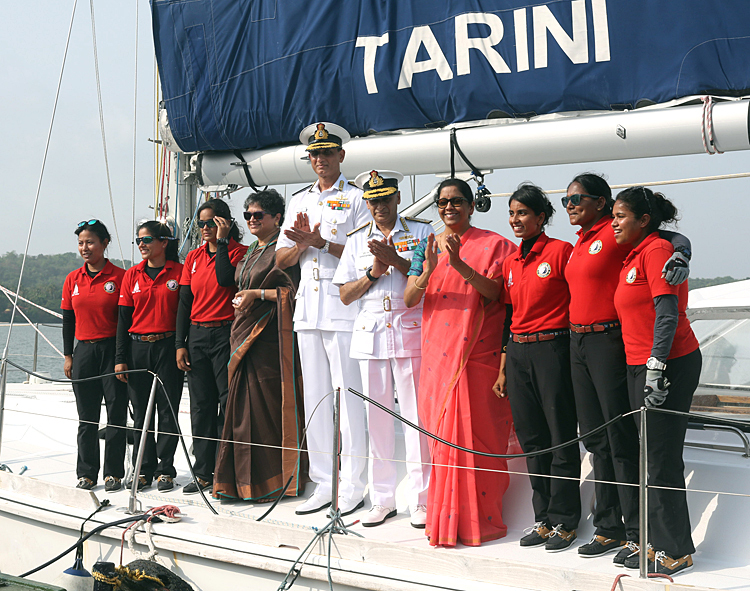 Speaking at the occasion, the Hon'ble Raksha Mantri, Mrs. Nirmala Sitharaman said that she is extremely honoured and feels humbled before the crew of team Tarini for what they have achieved. She further added that "it's not the girls achieving, it's the youngsters from India achieving. The women of this country have shown that it is possible for the youngsters, if they want to do something, that they can indeed do it, by showing commitment, grit and dedication". 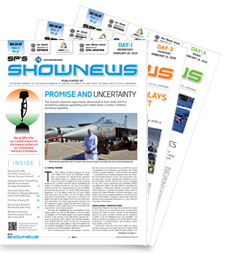 During his address Admiral Sunil Lanba Chief of the Naval Staff said, "The grit and determination displayed by these young women officers would definitely encourage future generations to take on daunting challenges and strive for success". 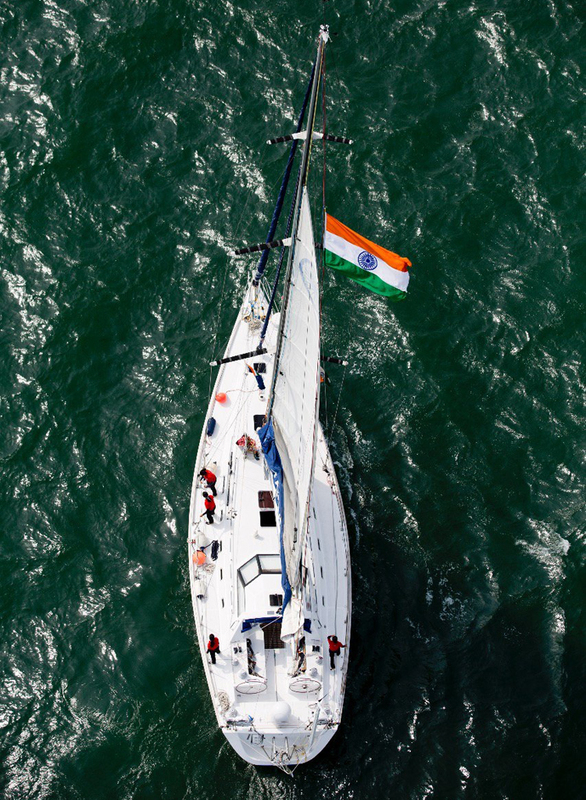 The indigenously-built INSV Tarini is a 56-foot sailing vessel, which was inducted in the Indian Navy in February 2017, and has showcased the 'Make in India' initiative on the International forum. The expedition titled 'Navika Sagar Parikrama' is in consonance with the National policy to empower women to attain their full potential. It has showcased 'Nari Shakti' on the world platform and helped change societal attitudes and mindset towards women in India by raising visibility of their participation in challenging environs. 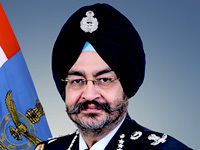 A senior naval officer said, "The women officers have done the country proud not only in showing the Indian Flag at distant shores but also in demonstrating the sea faring capability of Indian women." The women officers will be proceeding to New Delhi shortly, where they will meet the Hon'ble Prime Minister.